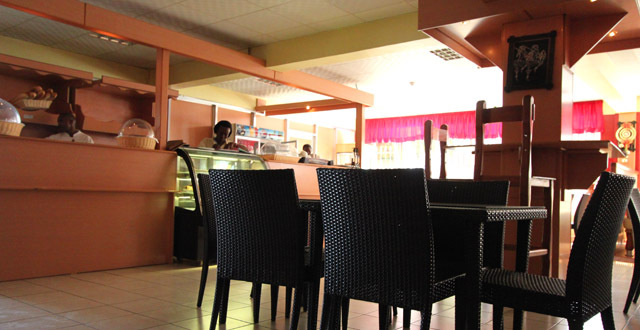 A new Kigali cafe seems to have sprouted up from nowhere in Kimihurura. I’ve never noticed this plot in my life, despite spending loads of time travelling through this part of town. Pure Africa Coffee is especially noticeable (and beautiful) at night, with their terrace popping up over the gate on the corner near Sundowner. It’s a wonderful location, the top part of the building (with its grass roof and timber framing) is beautiful, and the view is pretty remarkable. I stopped in last week for a laptop work session and some lunch and I was very happy that I did. My investigative journalism game is weak, but Facebook tells me that Pure Africa Coffee is based out of The Netherlands. The fact the website is in Dutch is also a clue. I don’t know anything about the world of coffee cooperatives but it seems like this is a Dutch company that imports Rwandan coffee, provides microloans, and also decided to open a cafe and guesthouse in Kigali. I could have this all horribly, horribly wrong, but this is my theory on the matter. The menu at Pure Africa is small and consists of the usual cafe fare of omelettes and sandwiches, but the drinks are a bit more interesting. The coffee is great and I was very pleased to see a giant pot of strong ginger and lemon tea come at me when it did to help cure an oncoming cold. But it’s the view from this place that’s the real star. I always forget just how stunning a city Kigali is and it only takes a few hours back in town to be reminded that almost everywhere has an amazing view. This cafe has, without a doubt, one of the best views in the city. It’s breezy and open on three sides and pointed towards Kigali’s CBD skyline. I’m not sure I’d want to be up here in stormy weather, but on a beautiful sunny day I can’t imagine there are many better places to be. I ordered avocado toast and I was impressed by what I got for just Rwf 3,000 – I had no idea it came with chips and the triple-decker sandwich was massive! But, alas, it’s not exactly the hipster-y avocado toast that we’ve all grown to know and love. It’s more of a vegetable sandwich. Sure, it’s a delicious veggie sandwich but, for me, a sandwich has to have meat in it. Or a chunky piece of delicious cheese instead of meat. Or at least an egg. It’s a quirk of mine. In fact, I’m not sure I’ve ordered a purely veggie sandwich in my entire life. However avocado toast is different, and I was hoping for some nice, thick, toasted bread with some delicious Rwandan avocados smashed on it. This is not it. But I think I’m just being difficult because the sandwich actually was quite tasty… it’s just not what I was hoping for. Though it’s certainly a bargain for Rwf 3,000! But I will always find it in myself to look past the unfulfilled promise of avocado toast when a server brings out some legit pili pili (chili sauce) with my meal. All will be forgiven! No matter where I go in Kigali, you’ll always find me singing the praises of the places that serve up their own, homemade pili pili. Cafes and restaurants that go the extra mile to offer something beyond Akabanga really stand out to me in a great (and spicy) way. I mixed this beautiful stuff with the ample mayo they served alongside my fries and sandwich and created a perfect dipping sauce. I’m way too wimpy to go 100% on the pili pili so this mayo combo has always been my secret weapon. If you’re feeling a little crazy, stir in a bit of ketchup. Madness, I tell you! Tasty madness. I was happy to see this new place full of people when I was there. It was a nice mix of laptop zombies such as myself, a couple of small groups who were having work meetings, and some families with young kids chilling on the cozy-looking couch at the back. The service was really friendly, but because it’s a two-level place, it’s not always possible to get their attention when you’re looking for them. But it’s a super chilled out place and I didn’t mind that I had to sit tight and wait for someone to head upstairs. They also have seating downstairs if the top is full. The wifi was fast an reliable and I really enjoyed hanging out there. Pure Africa is yet another wonderful addition to Kigali’s growing cafe scene. It sort of blows my mind to think back to 2010 when I first arrived when Kigali was a bit of a cafe desert with just a handful of choices. These days it seems like there’s a cafe on every corner and more popping up all the time and there’s no need to meet people for coffee at Bourbon five times a week like the days of old. Take a trip to Kimi on a sunny, clear day and check this place out!